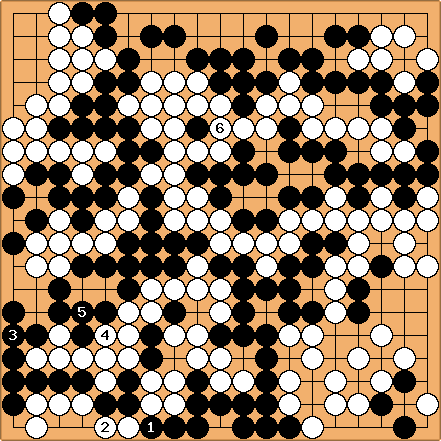 Calvin: This is a game of Rui Naiwei 9d (W) vs. Chen Yaoye 3d (B) from the 2nd Cheongkwanjang Cup Hors Concours Match. The result is recorded as W+0.5, but when I finish the game, I get B+0.5. What am I missing? 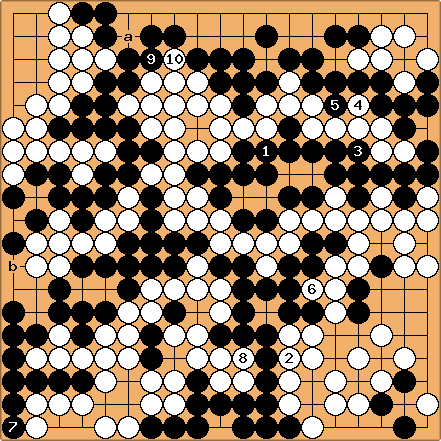 (Komi is 6.5, White has captured one more stone than black during the game.) White has just filled in a ko with . I don't think there is anything left but dame, but when I count this I get B+0.5, not W+0.5. Perhaps white can force black to play at 'a' somehow if she plays 'b' earlier. Please help with the best endgame sequence here.